How to love is a brilliant read which devoured in pretty much one sitting unable to put it down. 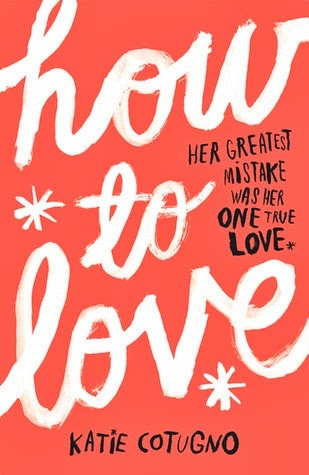 How to love is the story of Reena and Sawyer and their messy relationship. It is told flitting between past tense Reena who is in love with Sawyer from afar and present tense Reena who is faced with the return of Sawyer after he has been missing for the past two years while she struggled alone and pregnant with his child. Quite honestly I'm not sure I have the words to do this book justice. What I loved about it was how messy and complicated the relationship between Sawyer and Reena was. It was full of baggage and didn't run smoothly once and stops and starts and is brilliant in how it portrays that first chaotic love which isn't as picture perfect as films and books would have you believe. The story packs an emotional punch on several occasions and doesn't do at all what you'd expect it to do. Put simply I loved it and couldn't get enough of it!! Hands down one of my favourite books this year! I absolutely loved the characters and the relationships and just everything!